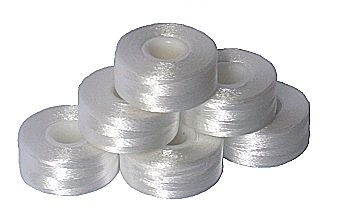 White prewound bobbins, sideless, with plastic core. 125 yards of premium quality poly filament thread on each bobbin. L size - universal for most embroidery machines. These prewound bobbins include the largest possible amount of thread per bobbin, as they have no sides and this free space is taken by extra thread. After trying these bobbins, we bet that you will never agree to wind bobbins again, because using pre-wound bobbins saves your time, money and frustration. There is a lot more thread per "factory prewound" bobbin than on any "home wounded" bobbin, so you embroider much longer, without stopping in the middle of a design. The best part is that prewound bobbins can be purchased for less money than regular bobbin thread. So why would you ever want to work hard & wind bobbins yourself again?